Cashew nuts are among the most nutritious nuts in the world. Cashews are low in fat, have zero cholesterol, are high in protein, and include a large amount of important vitamins and minerals. Cashews contain significantly less fat than peanuts or other common snack nuts. The fat that cashews do contain is a heart-healthy, monounsaturated fat called oleic acid (similar to that found in olive oil). 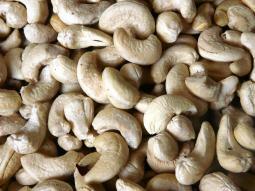 In fact, some studies estimate that the daily consumption of a small amount of cashew lowers the risk of heart disease. A diet rich in cashew nuts also assists in maintaining healthy blood pressure levels by improving the sensitivity of a key reflex called the baroreflex. Cashews are a great source of protein, making it an ideal food supplement for vegetarians and vegans, and a healthy choice for dieters. Cashews contain a high amount of vital minerals such as phosphorous, which builds bones and teeth, and magnesium, which promotes energy release and bone growth. Cashews also deliver small amounts of other essential minerals such as potassium, calcium, and selenium. The cashew nut is a good source of iron, essential for the formation of hemoglobin which is an important component of red blood cells that transports oxygen from the lungs throughout the body. The nut isn’t the only part of the cashew to deliver valuable health benefits: the cashew apple is a versatile fruit rich in vitamin C. The apple can be eaten right after harvesting or be processed into a nutritious and refreshing juice. Cashew apple juice is low in calories, with 200ml containing approximately 62 calories.